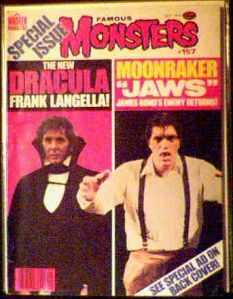 September 1979 issue of FM with articles on the new Frank Langella Dracula and Moonraker's Jaws(Richard Kiel). Near mint condition. Richard Kiel was Ted Cassidy's major competition for all the "giant" roles in Hollywood. They were probably running into each other at auditions all the time. Website design and hosting by Sohodojo Business Services. Item 133 of 466 items displayed in viewer. 0 items in cart.